The Culinary Center of the Computer Graphics Universe! 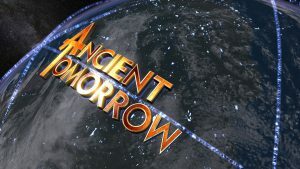 For the last 2 years Dan Seely & Pixel Kitchen have been working with Higher Earth Entertainment to produce 52 3D CGI Animation shots for their documentary “Ancient Tomorrow”. Produced and directed by J.J. Yost with animation designed and directed by Dan Seely. The project premiered this last fall in Denver and more recently in L.A. This 1 hour 25 minute documentary had the animation team virtually traveling to many corners of the globe and exploring fantastic structures and processes of the earth. The premise is a search for the technologies of risen and fallen civilizations prior to our current one more then 10,000 years in the past. Civilizations which had developed much different approaches to their creation and distribution of energy. It is proposed the earth is ringed with a network of natural occurring lines, corridors, or circuits of energy moving about the globe. With that knowledge, the ancients developed earth friendly generation technologies which if rediscovered, would be extremely valuable towards solutions of some of our most pressing energy issues. Suppose the Pyramids at Giza were actually older, much older, and were designed not as tombs but as power stations using naturally occurring phenomena to generate electricity. This abundant energy is then injecting it into this network of power conduit circling the globe to power that ancient civilization. This theory is supported by the wireless power transmission experiments of Nikolas Tesla. As this documentary searches for clues to this mystery, the film crew mounts expeditions to locations where the nexus of the power lines intersect. They explore the areas, usually populated with pyramids or other ancient structures, interview the local experts for mystery or legend. Pixel Kitchen’s part has been to visualize these theories focusing on presenting the evidence using forensic 3D animation techniques. We have been recreating archeology sites, illustrating phenomena and traveling the cosmos to help the team image the theories and tell the story. Our job is to start with the existing, fill in the missing with our best visual guess and to see how the dots connect with the work of the rest of the teams research. This entry was posted in Pixel Kitchen News and tagged 3D, Ancient Tomorrow, Animation, energy, Giza, leylines, power, pyramid, tesla. Bookmark the permalink.